Fonterra’s discovery of the bacterium that causes botulism in a batch of whey protein concentrate has alarmed many. As the whey protein is an ingredient in popular infant formulas, many parents will be worried that they have inadvertently exposed their children to potentially fatal bacteria. Hopefully, the recall of products that use Fonterra’s whey ingredient will prevent any illness, even if it appears that these recalls may have been tardy. One would also hope that Fonterra learns from the experience, because when Fonterra stumbles, so does the rest of the country. This latest incident illustrates once again how important it is that New Zealand diversify its economy. In fact, this is the subject that I address in my upcoming book, Get Off the Grass, co-authored with the late Sir Paul Callaghan. I’ll be launching the book with a public talk at Victoria University of Wellington on August 15th (register here if you would like to come along), with the paperback hitting bookstores the following day. In Get Off the Grass, Sir Paul and I investigate why New Zealanders work harder and earn less than most other people in the developed world. In Sir Paul’s previous book, Wool to Weta, this was framed as a choice: we choose to be poor because of the types of industries that we prioritise, such as farming and tourism, earn us relatively little per hour worked. In Get Off the Grass, we use ideas from economic geography and the study of complex systems to investigate why it has been so hard to innovate our way out of these low productivity industries. 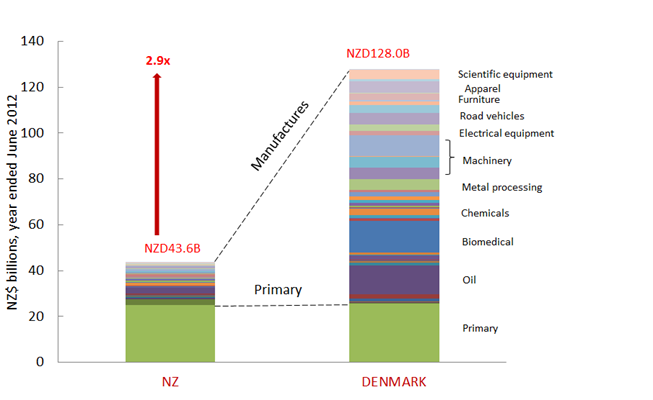 To illustrate just how specialised New Zealand’s economy is, I have borrowed a figure from Dr Helen Anderson, which compares the diversity of our exports with those of Denmark. Like New Zealand, Denmark has a strong agricultural base. Unlike New Zealand, Denmark has made concerted efforts to diversify its economy over the last few decades. We are constantly told that New Zealand is too small to do everything, yet Denmark, a country with a population of only 5.5 million people, manages to do a heck of a lot more. There is a deep flaw in our reliance on the 100% Pure brand. We need the edge our clean, green brand gives us to sell our agricultural commodities at good prices, yet the production of these commodities actually damages the environment. See this piece I wrote for Unlimited magazine last year. Economic diversity is crucial for long-term economic stability, and this in turn is crucial for growth. The fluctuations in our dollar caused by the contamination of one of our major exports illustrates why. The volatility caused by such crises in turn hurts other export sectors, making it even harder to get off the grass. Diversity is regarded as a crucial ingredient for innovation, so our strong focus on agricultural research actually makes us less innovative as a nation, whether in agriculture or otherwise. Physics and chemistry have contributed an awful lot to agriculture, but agricultural science has not returned the favour. Specialisation in a single industry is just not a good long term strategy. No industry stays on top forever, and if your favoured industry becomes too important to fail, it will prevent you moving into other industries before it’s too late. Detroit, with its dependence on car manufacturing, is a classic example. Although Detroit’s car industry has vast scale with the three biggest car makers in the US, the city is now a basket case because its mono-cultural manufacturing sector has failed to reinvent itself in the face of strong competition from overseas manufacturers. As I said when the National Science Challenges were announced, our dependence on the primary sector leaves our economy perilously exposed to volatile commodity markets. Jacqueline Rowarth told Radio New Zealand that previous attempts to diversify our economy had failed. Get off the grass – we’ve yet to make a serious attempt! Its nice seeing a comparison to Denmark… but like most things, sure its nice seeing it, but how will NZ get uncoupled from the primary industry focus. Especially when substantial amounts of innovation funding ex MPI or MBIE are focussed on primary industries. Sure it may be driving some consistent productivity increases, but they will be small percentage gains each year, They are not driving the large changes that are required. All game changers are quickly sold offshore due to lack of funding locally. Why invest in a risky innovation programme when you can buy properties and make consistent tax free income. Denmark does have the advantage of having its main markets a short drive across an open land border (or a bridge). States within the EU are more like US states in terms of the ease of trading with each other. richdrich got to my question first (kind of), I was going to ask how relative distance adds to the difficulty in diversifying. Should we manufacture a range of goods for export would the cost of that travel (given our remote-ish island status) create a significant barrier? I’ve heard arguments that we should be heading towards a more knowledge-based economy (software and science I suppose). Is this a response to the distance problem? Does New Zealand not have a unique problem in trying to gain any wealth when it’s most profitable industries, Insurance, Banks and Supermarkets, all overseas owned, export their profits? It has to be a race to the bottom when this happening. 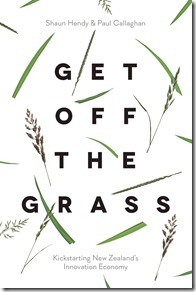 I am interested in exploring and discussing the ideas in this book (“Get Off the Grass”). Is there an online forum or similar where this is / has happened? I’ve just finished reading “Get off the Grass”. I very much enjoyed the insights involved. For many years private R&D has significantly been lagging OECD levels. From my own experience from working for IRL (10y) and then Fonterra (7y) I have observed that the major qualifying reason for this has little to do with culture or educational availability. Any perusal of graduate surveys will show our institutions churning out hundreds of PhD’s per annum. Yet few find employment in the private sector. Almost all are employed by universities, schools, CRI’s and the public service. I consider a major reason that has been overlooked has been the almost unique trading position of NZ agriculture in the world market. We have since the early 1970’s been subject to mega-tariffs from developed countries. Dairy has had 300% tariffs into both the EU and USA, 800% tariffs into Japan. All except a small historical component has been subjected to this (78000T UK butter quota, 18000T USA cheese quota). So basically it’s uneconomic to export additional product to these markets. So pretty much all the expansion in the past 40 years has been to third world markets. At third world prices. The consequence of this is that when you come to use R&D to develop new products there is no market for them. You can add as much value to a block of butter, you will not sell 1kg more into the EU. And the third world doesn’t care. They just want the product as cheaply as possible because they are poor and hungry. I think you will add some value to the NZ economy from high added value products such as F&P. But for sometime yet such a sector will sadly be just a bit player in the room to the major player which, like Oil is to Norway, is the agricultural industry.